The World’s Best Resume Writer competition has been hosted only once to-date in 2008. There are plans to host it again in 2015 or 2016. Open to any English-writing resume writer in the world, non-members included. Diverse judges panel consisting of HR managers, Sr. recruiters, OD specialists, and certified resume writers. Unique standardized content on one subject where everyone creates a new resume based on content provided. 2008 target client: sales & sales management professional. Each registrant could contribute only one (1) entry. The Awards Committee Director ensured all submissions appeared anonymous to the panel so that fair and equitable judging could take place. The panel selected first, second, and third place winners. Winners were announced on March 1, 2009. Awards, certificates, and logos were sent to winners. Again, this competition is currently not open. We will post information when it is again available. Distinguish yourself by being selected as a first, second, or third place winner of the World’s Best Resume Writer competition. No other opportunity of this scope has ever existed for professional resume writers. Attaining this accolade will truly allow you to benchmark to your prospects and clients that you are the best of the best worldwide. Participate in a fun and competitive venue for judging the quality of your craft against national and international standards with a highly esteemed panel of judges. Receive a copy of CDI’s Resume Writing Guide, a 66-page instruction manual (a $39.95 value). Attain recognition amongst your peers. Leverage media publicity for your achievement(s). Receive a prestigious WBRW award and appropriate website / print graphics for marketing, advertising, and promotion. 1st place winner will receive a 1-year CDI membership ($180 value). A second chance to be #1! CDI will host a public choice competition between the top three resumes through Facebook.com and CareerDirectors.com. The public will choose their 1st, 2nd, and 3rd place winners. A separate set of winner certificates and logos will be issues. Again, the World’s Best Resume Writer competition is open to both members and non-members. Neither membership or certification as a resume writer are required. The registration fee includes a copy of the CDI Resume Writing Guide, a $39.95 value. Once registered, you will receive the candidate profile in 1-2 business days. You will use this profile from which to write your award-winning resume. Submission instructions will be included. The entry deadline has passed! Judges are bound by confidentiality and have no knowledge of the authors whose resumes they are reviewing due to the blind evaluation process. Contacting of judges by a participant before, during, or after the competition will result in termination of participation from this and future CDI competitions. 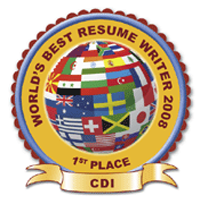 All professional resume writers who write in English are eligible to enter the World’s Best Resume Writer competition. Membership in CDI is NOT required. Certification as a resume writer is not required. Only one (1) submission will be accepted per registrant. Please make sure your first submission is the correct one. Winners of the 2009 competition were announced March 1, 2009. Awards, logos, and certificates were be conferred via mail. Winners who choose to display their award logos on their website or blog must contain an active link to the CDI website. Winners understand they forfeit their awards should this be removed. Editing, tampering with or using a logo without permission will result in revocation of the award. Depending on the scope of the infraction, further actions may be taken by CDI including legal action and/or revocation of membership. A one-time registration fee is required to participate, which will assist us in covering the expense of awards, shipping, and administration. Registrants will receive all submission instructions and guidelines along with the candidate profile via email. Registrants will also receive the 66-page CDI Resume Writing Guide, a $39.95 value. Once candidate profile is emailed (within 24-48 business hours), no refunds are available unless the entire World’s Best Resume Writer program is cancelled due to extenuating circumstances with CDI. The Awards Committee Director will ensure all submissions appear anonymous to the panel so that fair and equitable judging can take place. The panel will select first, second, and third place winners from the entries received. Failure to follow these and other submission guidelines will result in elimination from the competition. The volume of submissions makes it impossible for the Award Committee Director to grant special provisions for those not following instructions. No refunds will be made available for registrants not submitting their entries. Registrants each receive a copy of CDI’s Resume Writing Guide, a $39.95 value. Client profile in MS Word (.doc) for a job seeker who is a specialist in sales and sales management. The content will include both relevant and irrelevant client data, similar to what you might have seen in a resume writing certification process. (See ‘About the Resume Project’ below for more information on the project). Submission guidelines on how to name and save the resume file along with instructions for using the online system. Code number for naming your resume (to ensure we can match your submission to your registration). While the CDI Awards Committee wanted to create a competition that was challenging, they also wanted it to be fair, representing a job seeker and job target that would be familiar to virtually all candidates. With that in mind, the category of revenue-producing retail sales manager was selected (or retail sales manager with individual sales responsibility). Employment history including sections on: products/services, challenges, and responsibilities coupled with results produced. This is a sample only; not the complete resume note file for entry into the competition.